food network addict: Mary Alice Is Looking Good! Mary Alice Is Looking Good! My buddy Mary Alice from Ace of Cakes has always been a fine lookin' lady (just check out this darling account of my visit to meet her almost THREE YEARS AGO! ), but I am now officially shocked and amazed by this little skinny minnie appearing before me in this MedifastMaryland ad! 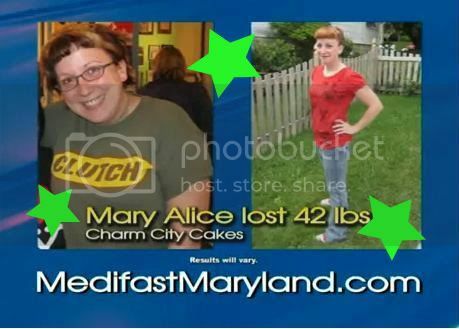 Mary Alice lost 42 lbs the ad proclaims. Wow! I don't know what you have to fast on to lose 42 lbs, but I'm sure it's not all the leftover cake they have sitting around the bakery. Wow, good for her. We were getting alarmed there for awhile. Maybe Goldmember should take notice and sign up next. If it's a happy thing for her and done in a healthy manner, great. Frankly, though, I've always admired her, curves and all. Well rounded women are hot. Oh wow! Good for her! Though between her and Alton having lost insane amounts of weight, it makes me wonder who's next! Congratulations to her for weight loss and her much better looking hair. Unfortunately, I still stopped watching the program because of her too frequent comments and, of course, the total irrelevance of Duff Goldman himself. Talk about a way to ruin a show. I think everyone is hilarious... and i love mary alice, bigger or smaller. she's one witty, groovy chick. I think she looks a little anorexic.